We've worked with Decorilla in the past with great success. We'd like to try the process again for entire home in Manhasset. 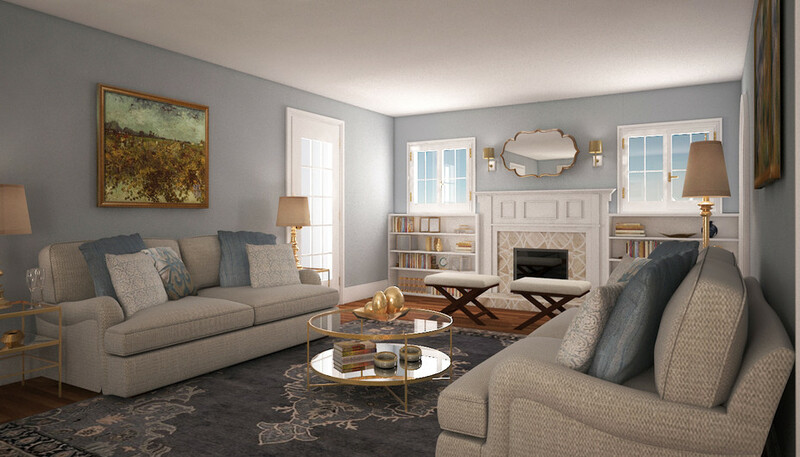 We would like our Manhasset home to be designed in a more traditional/transitional style. The kitchen, foyer, and dining room wallpaper are staying (thus we would like to ensure we dont clash with the wallpaper in these rooms in the rooms we decorate). 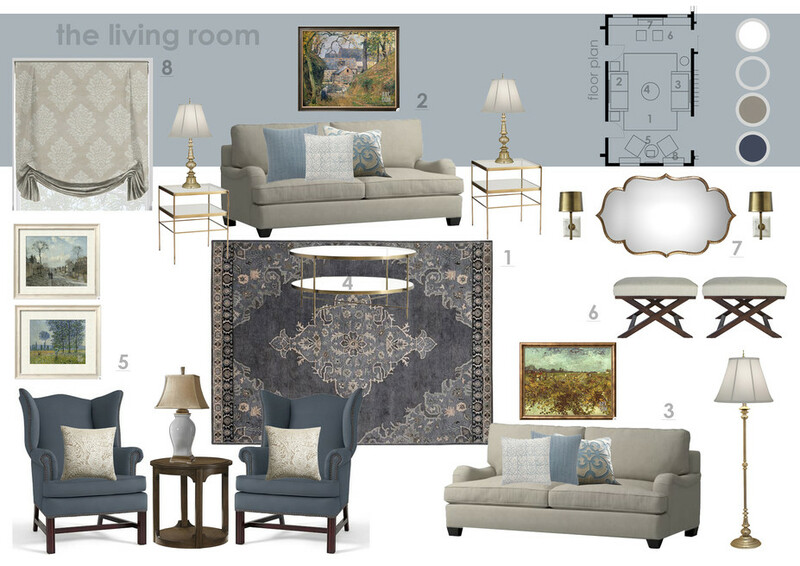 All runners, rugs, and window treatments are being removed so we look to decorilla for guidance on these items throughout the design process. We are cost conscious...as we are doing a renovation on this home in some areas and plan on doing the entire home with decorilla. Thus- we would prefer to stay around 10K on this room but the absolute max is 15k. If we go over on this room we will need to cut our budget on other rooms. I have a daughter and a fluffy white cat who sheds a lot of white hair...thus we are looking for durable materials in our home (thus we need fabrics that hold up/especially on the sofa or seats that will be used a lot) - also we need rugs that won't show stains if possible. I want the room to feel warm and inviting. This will be the main room we hang out in with our family as well as with guests (it really should be called the family room- not living room). I love texture, different fabrics etc. we would like to have a comfortable couch in the room as we plan on using this room a lot (as well as somewhere to put our legs up- ottoman pouf chaise etc). I am keeping the fireplace but want to take out the tile around the fireplace (hopefully decorilla can make a suggestion). Also- I would like to replace the window treatments as they are extremely traditional. 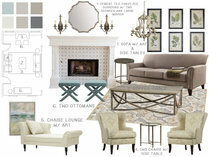 I am ok replacing the sconces around the fireplace too (would look to decorilla for suggestions). We do not plan on putting a TV in this room and do not need any additional storage as we already have bookcases on each side of the fireplace that can be used for storage. We are not exactly sure what color palette to go with in the home- we do know that the wallpapers that we are keeping are ivory/taupe/brown and whites. 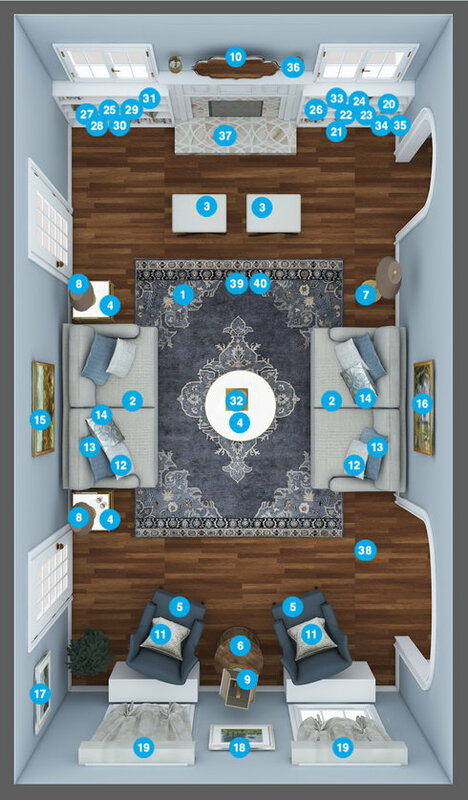 We would look to decorilla to help us with this-we do like neutrals but are also ok with a pop of color if u think that would suit the room well. We do like blues as you can tell from our other house but also like ivories, grays, browns etc. We are open to suggestions on a color palette for sure! One thing to note is that I like things to match - look like that go together (have cohesion). Room feels dark to me. Also the existing decor is not exciting or fresh. It looks dated and old to me. I don't like the tile around the fireplace or the sconces. 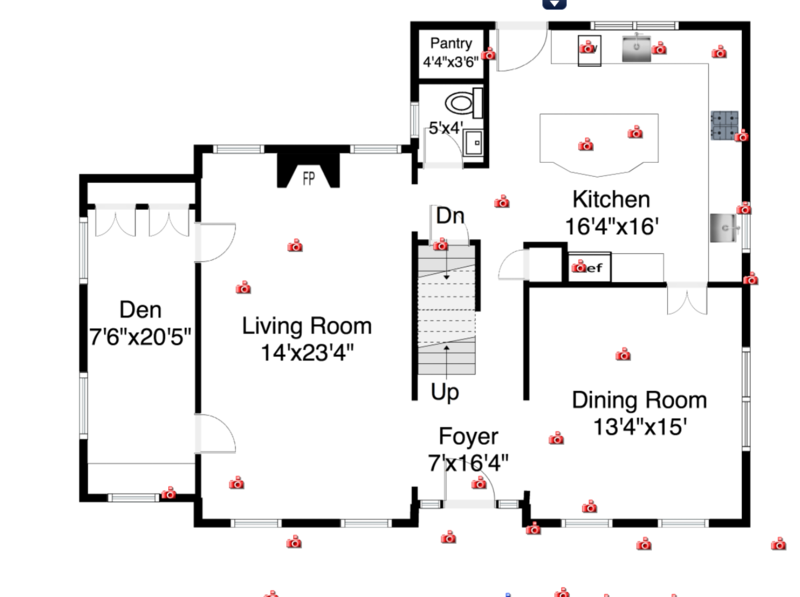 We plan on keeping the existing wood floor but are open to area rug. We are also keeping the bookcases but open to painting. We are keeping the gas fireplace but would like to replace brown tile around fireplace. thank u so much - room looks amazing! i am soo excited! Leona Round Coffee Table and 2 cube table set Made of glass and mirror with an iron frame. Adjustable levelers provide stability on uneven ground. Discount link available to project holder only Round coffee table: 18''H, 36'' diameter Side table: 22"H, 18" sq. Stiffel 1320-N4555 67H in. Floor Lamp Traditional floor lamp finished in Milano Silver Topped in off-white silk Shantung shade Features 3-way switch Requires one 150-watt bulb (not included) Discount link available to project holder only Shade dimensions: 10L x 20W x 15H in; base dimensions: 67H in. Quantity: 2 Stiffel table lamp. Made in USA, in Linden, New Jersey. Metal construction. Milano silver finish base. Oyster silksheen shade. Rotary switch. Takes one 150 watt 3-way bulb (not included). Discount link available to project holder only Base footprint is 6 3/4" wide. 31" high. Shade is 8" across the top, 16" across the bottom, 12" on the slant. Quantity: 2 47% rayon, 31% linen and 22% polyester Inset zipper Dry clean only Down-alternative insert: 100% polyester fill (made in China) Made in multiple countries Discount link available to project holder only 20"sq. Quantity: 4 Made of 100% cotton printed Dhurrie fabric. Reverses to solid ivory cotton. Button closure. Discount link available to project holder only 18"sq. Quantity: 4 Made of a 70% cotton and 30% linen blend with a herringbone weave. Reverses to solid cotton chambray. Concealed zipper closure. Discount link available to project holder only 22"sq. Quantity: 2 Color: Blue Cover material: Linen Spot clean only Discount link available to project holder only 18"sq. Van Gogh: Vineyard, 1988 by Vincent Van Gogh (ITEM# 12916162661A) Style: PARMA Gold Wide - Width 2" Glass: Acrylic: Clear Discount link available to project holder only 46" x 37"
A farm at Montfoucault, 1894 by Camille Pissaro (ITEM# 22111808864A) Style: PARMA Gold Wide - Width 2" Glass: Acrylic: Clear Discount link available to project holder only 40" x 34"
La route de Louveciennes by Camille Pissaro ( ITEM# 8121355771A) Style: NANTUCKET - Width 1.875" Mat: Crisp - Bright White Glass: Acrylic: Clear Discount link available to project holder only 28" x 25"
Fields in spring, 1887 by Claude Monet (ITEM# 33916160941A) Style: NANTUCKET - Width 1.875" Mat: Crisp - Bright White Glass: Acrylic: Clear Discount link available to project holder only 28" x 24"
Celtic wooden beige and thassos marble tile Chip Size Random Sheet Size 9" x 9" Coverage .56 sq. ft. Color Beige and White Material Wooden Beige + Thassos Finish Polished Floor/Wall Wall/Floor Weight 3.3500 Discount link available to project holder only Sheet Size 9" x 9"
Craddock Indoor Area Rug Pad by Darby Home Co (SKU: DBHC1001) Adds cushion and absorbs shock and sound Will not stain or discolor floors Suitable for indoor use only Can be used on hardwood floors Can be used on a radiant heated hardwood floor Can be used on tile Can be used on carpet floors Can be used on painted flooring Can be used on laminate wood floors Non-slip Coating: Yes Will not cause any residue or filming to laminate wood floors Compatible with stained concrete floors Can be used if the rug is on a carpet Will not protect the floor from water Can be used on vinyl plank flooring Can be used with a carpet on carpeted flooring Can be rolled with the top inward or the bottom inward Rug pad does not leave a residue after using it over time Backing type: Latex Discount link available to project holder only 9" x 12"
Quantity: 6 Cover is a strong microfiber polyester material Filled to a 4 inch thickness that will stay plump and keep its shape Filled with Hypo-allergenic polyester fiberfill Perfect pillow for stuffing decorative pillow shells Machine wash and dry Set includes 2 pillow inserts Discount link available to project holder only 18"sq. Quantity: 4 Cover material: 100% Cotton Feather filled for luxury and loft Color: White Discount link available to project holder only 22"sq. Quantity: 2 Color: Sky blue/ light grey Cover material: Linen Spot clean only Discount link available to project holder only 18"sq.